Goodbye Jag: What a case-report will not tell. Case reports (CRs) are considered an important tool in conveying information about unusual clinical cases. They serve an important purpose in sharing knowledge with colleagues about often unexpected outcomes. These clinical events are then chronologically presented, analyzed and at the end a conclusion is discussed. Often more is needed. Sometimes the information that is not presented in the CR provides insights that may have a bigger impact on us than the pure clinical data. Sometimes more needs to be said. Sometimes we find ourselves crying. It was late on a Wednesday morning when the resident called. My patient, Jag, had died a few hours earlier. The sudden encounter with death leaves a long-lasting shadow in our lives. A shadow that lingers and becomes a memory. Jag’s story is linked to the burdened history of Dutch colonialism and slavery. His ancestors, enlisted as contract laborers, were brought to Surinam to work the plantations after the formal abolishment of slavery in 1863. 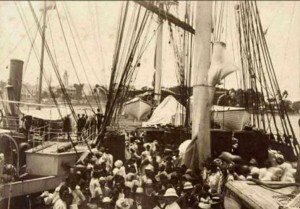 The first group of workers came from Calcutta and arrived in 1873 at Fort Amsterdam on a ship named the Lallaa Rookh. 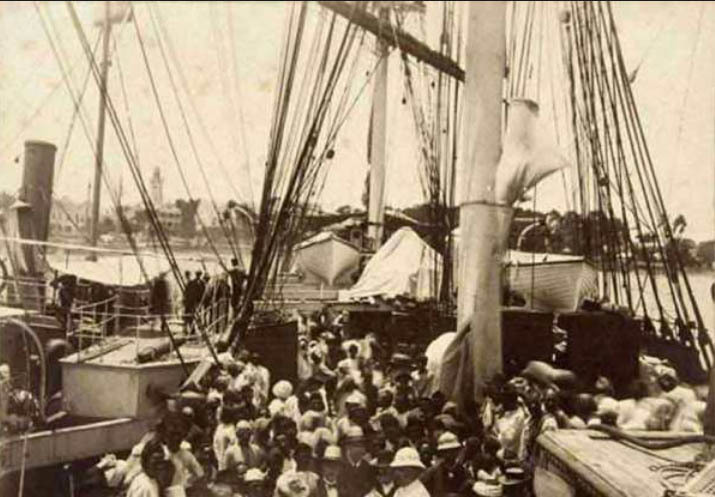 Between 1873 and 1916 an estimated 35.000 Hindustani from Northern India’s provinces of Uttar Pradesh, West Bihar and the Ganges basin were shipped to Surinam. They were forced to do hard manual labor under very poor circumstances. In 1975, Surinam gained its independence and many Hindustani who were concerned about the local political situation decided to move to the Netherlands. Jag came to Holland long after that great migration. Not having a Dutch passport now meant he was an ‘illegal immigrant’, an ‘unwanted visitor’. He had leprosy and needed specialist medical care so he decided to stay even when his personal circumstances were horrible. No work, no insurance and dependent on family members for food and shelter he lived on the fringes of society. His life was difficult, he learned to keep his head down, and didn’t complain about the many hassles he received from our immigration officials and hospital administrators. Living a life in obscurity, trying to stay below the radar, off the grid as much as possible. Living a life of stigma, a life with fear of discrimination from family members, friends and society. A life where a sense of positive-self-esteem and dignity were heavily challenged. When our dermatologist-leprologist was abroad I took care of Jag. Jag was thirty years old when I admitted him. The week prior, Jag had not been feeling well. Blisters, and ulcerations appeared on both arms and legs as well as a painful plaque on his forehead. The diagnosis: Erythema Nodosum Leprosum. Initially he responded well to treatment and he was in good spirits about his upcoming release from the hospital. But then his condition unexpectedly worsened. He had suddenly developed tiny vesicles on his trunk and neck; and to make matters worse he was experiencing severe colicky-like pains. Jag was in agony and passed away a few days later. His untimely death was shocking to all who had been involved with his care. His death, his passing evoked feelings of emptiness of loss. Paths that crossed. Memories that linger in the back of my head. His cause of death was registered as a fatal hemorrhagic liver necrosis due to a generalized, primary Varicella Zoster Virus infection. There is a strong felt uneasiness for me that pervades his story. The uneasiness we feel when we witness deep suffering. Suffering that is apparent in his whole history: his background, his life in Holland, being marginalized, the devastation and stigma of living with leprosy. His experience of ‘not being seen’ even when crying out in pain. The screams of this humble, soft-spoken man were not the hysterical acting out the consulting internist thought them to be. Cultural differences between doctors and patients can lead to misunderstanding and misinterpretation of what presents itself. The virus didn’t care. Jag did not know that hospitals are dangerous places for the immunocompromised. Viruses abound….. Jag died a lonely death in the ICU. Far away from home. I am now aware that early on the deck had been stacked against him and that the care he received from the nurses and the physicians was not enough to save him. That realization provides minimal comfort after witnessing the devastation some of us have to endure. Years have passed since Jag’s death but my ‘uneasiness’ remains. hHow many Jags are still keeping their heads down in Holland ? How many immigrants living with leprosy or some other chronic disease are not receiving the care they need ? How many of the faces we see on the daily news, those fleeing war, disaster, misfortune will make it? Recalling the historical information of Jag’s ancestors it seems as if I am reading a current newspaper. People in boats being transported in hope of a better life; not knowing that at the other end of the journey new hardships await. Not knowing that one day one of their descendants will provide a lesson of the heart to the doctors who took care of him. This entry was posted in Ralph Crawshaw and tagged death, doctor-patient relationship, grief, Hansen's Disease, leprosy by humanemedicine. Bookmark the permalink.